This is the percentage of all income, excluding capital gains, that goes to the top one percent. Are our rich content? It’s a question that bounces back and forth in the blogosphere. Are elites, economic and otherwise, happy with the pace of the weak recovery? Are they indifferent? Or are they actively worse off than they would be if unemployment were lower? This is the percentage of all income, excluding capital gains, that goes to the top one percent. And as you can see, it’s not just back where it was before the recession; it’s far exceeded that benchmark. And it’s exceeded all the years on record, with the one exception of 1928. Over the past 20 years, this percentage dropped after each recession. If you look, you can see it drop in the early 1990s and 2000s. However, it then recovered and exceeded the old rates. We saw this rate fall in the Great Recession. The obvious question was whether this would be a permanent break or whether it would recover and exceed the old rate. That question is now answered. As noted, the only year on record in which the top one percent took home a larger piece of the economic pie was in 1928, and then only barely. This excludes volatile capital income, in part to see a cleaner trend and in part because tax changes from the fiscal cliff and Obamacare probably influenced the 2012 results. 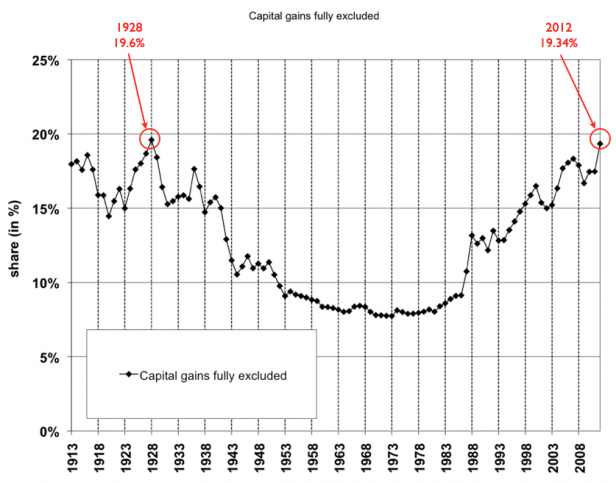 But the trend is nearly the same with capital gains, where this year’s 22.4 percent share for the top one percent is closing in on 2007′s 23.5 percent share (and 1928′s record high 23.9 percent). This pattern is also true when using average incomes. But this one chart is something I’ve particularly watched during the Great Recession. Because you could, at one point, say that the rich had taken a huge fall in the Great Recession, and therefore it was in everyone’s interest to get the economy back on track. That is harder to say today, and it will be harder to say next year as these trends continue in the absence of policy action. (Mike Konczal is a fellow with the Roosevelt Institute, on whose blog his post first appeared. The rich are never content, and probably seldom happy. 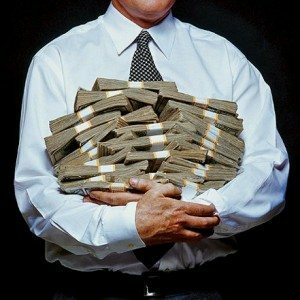 Someone’s always better than they are at making money, which throws their heads off-balance and awakens mighty and uncontrollable urges to commit more mayhem and theft. The recent coverage of those studies of CEOS that find a much higher rate of psycho- and sociopathic behaviour come to mind. Let’s face it, the accumulation of capital and resources is a lousy way to view one’s role in this world, for lots of reasons; not the least is, that it produces suffering. There’s a kind of soullessness about the culture that is evolving, a culture that can only justify itself with nearly religious belief in the superiority of certain individuals who can make the world work by first getting hold of its assets.